-A teaspoon per cup of organic unsweetened peanut butter. – Prepare your muffin tin with the liners. – Melt the coconut oil in a small saucepan. – Add the dark chocolate to the melted oil and melt on low heat until smooth. – Drop a small spoonful of melted chocolate into each liner, making sure to use a spoon or small spatula to coat the sides of the liner all around. Place the tin in the freezer for about 20 minutes. – Mix the correct number of teaspoons of unsweetened peanut butter with about 1 drop of stevia for every 2 teaspoons of peanut butter. 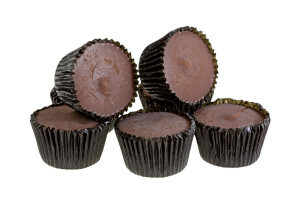 Drop about a teaspoon or so of the stevia sweetened peanut butter inside each cup. Place the tin back into the freezer for about another 20 minutes. Then cover the top of each one of the cups with the melted chocolate. Place entire tin back into the freezer for another 20 minutes. Serve cold or frozen. Garnish with wiped cream.